Relaxing with a Cigarette -- Let's have it ! I spent part of the day looking through some old photographs, taken before I had a digital camera. I picked a few out to scan, and of the first batch that I have uploaded here’s one which I think is nice, even if it is slightly out of focus. Perhaps it’s even part of the charm, the soft focus. 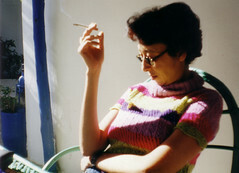 Taken around 2001 in Sidi Kaouki near Essaouira in Morocco, Halima was sitting outside of a small café having a coffee & cigarette. Since I got a digital point and shoot camera, I haven’t shot any photos on analogue film. I think that’s a bit of a shame, because my old SLR had better optics and you could do much more with depth of field and soft focus. Perhaps I ought to go back to analogue – though you can only get film developed by sending it off (like when I was a kid with my little 110 format point and shoot). Pipe dreams and nostalgia. A digital SLR might be a reasonable compromise, but they’re still upwards of the 500€ mark. This entry was posted on Saturday, April 17th, 2010 at 7:26 pm and is filed under general. You can follow any responses to this entry through the RSS 2.0 feed. You can leave a response, or trackback from your own site. Did you hear about the two blondes that were found frozen to death in their car at the drive in? Yeah, they went to see "Closed For The Winter"